The name of this student was Alex Henige, and that’s how his bright idea of bio-recycling was born: to create a paper cup which could turn into a real plant after being utilized. This idea clung with Alex during his further trips where it occurred to him that the negative effects of garbage are much more serious than we all could imagine. The student says: “The idea that things are thrown away and end up in landfills just seemed strange”. Though the problem of large amounts of random trash everywhere has always been an issue, he decided to concentrate on simple paper cups to start moving forwards. Alex found that Americans alone consume up to 146 billion of paper cups per year which literally makes blood run cold. From a practical perspective, paper cups are omnipresent in our modern busy society. And the fact that cups produced from recycled paper can be then recycled less than four times encouraged his belief in the idea even further – since the materials in a cup end up unusable in the end, even recycled cups finish off in landfill. Besides, a regular recycled cup contains polyethylene. In case you don’t know, polyethylene is an artificially produced polymer which takes 100-1000 years to decompose. What questionable legacy of barely degradable poison we are going to leave behind. 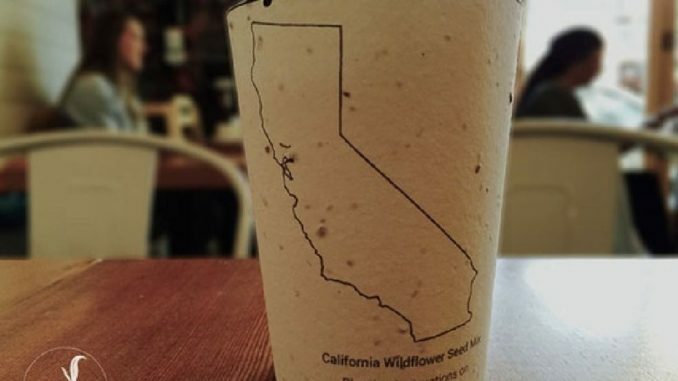 So, armed with terrific knowledge of 146 billion cups and the amount of negative impact they contribute to pollution, Alex set out to create a compostable cup with embedded seeds that might be soaked in water and then planted in soil. After a little bit of researching, Henige found a perfect alternative to paper – cornstarch-based PLA. Great thing is that this material could kill two birds with one stone: first off, cups made from PLA plastics turned out sturdy enough to withstand hot temperatures and, the last but not the least, these cups showed a relatively short biodegradation rate – approximately 180 days or around six months compared to hundreds of years. The guy also found a method to embed seed of local trees into this eco-friendly paper and designed plant-based ink with environmentally friendly properties. At the moment Alex is in the process of testing various conditions and soil types for his bio cups to optimise the green technology. He’s also trying to find different seeds which could hold hot beverages and at the same time would allow to reduce the period of decomposition. Alex has produced more than 200 hand-made cup prototypes so far and managed to grow his at-home project into a prominent startup named Reduce.Reuse.Grow. After he launched his Kickstarter campaign that happen to bring twenty thousand dollars, the enthusiastic student is searching for partnerships to take on different parts of the development and draw in commercial companies for large-scale production. Although Alex’s ambition to extend the project through the whole world is promising and quite real, he’d like to zoom in on perfecting the cup first. “I wanted to develop a product that is positive and satisfying”, Alex says.